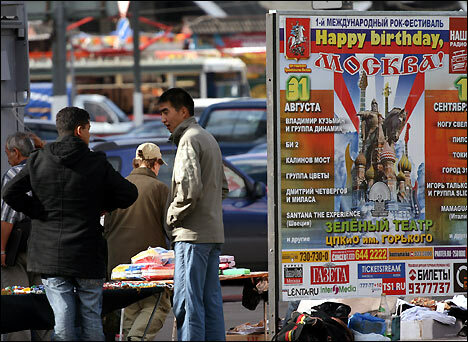 The capital of Russia celebrates Moscow Day on September 1. Needless to say, it is Muscovites Day as well. As things stand meanwhile, Moscow is being built by the people colloquially known a Gastarbeiters from the former Soviet republics. Many of them make some money and immediately leave for the distant Motherland. Others, however, chose to stay in Moscow. Contrary to the widespread opinion, labor immigrants are not just street-cleaners and seasonal workers. There are lots of doctors and scientists, designers and actors, restaurateurs and businessmen among them. How do they become Muscovites? What attracts them to Moscow? Why do they choose to brave everyday racism and redtape involved in the procedure of legalization? And why do others choose to leave? Here are several stories of the people who regard Moscow as almost their native city. Some of them are citizens of the Russian Federation, others rent slums somewhere in outlying Chertanovo and do not even entertain the idea of remaining in Russia longer than absolutely necessary. All these people sweep our streets, repair our autos, feed us, and baby-sit our kids. Their stories answer at least some of these questions. Tamara would have never dared leave for Moscow were it not for a crisis in the relations with the family. As it happened, the girl of barely 20 hit the road and left her native Bukhara without any clear idea of were she was going. She ended up in Moscow, where her uncle's widow was living. Feeling of discomfort settled in eventually and Tamara began looking for a job since she knew that nobody was waiting for her in Bukhara anymore. A great deal of jobs were available to whoever had the Russian citizenship but Tamara did not have it. She was compelled to look for any job therefore as long as employers did not demand Russian citizenship or registration in Moscow or the Moscow region. Tamara landed a job with a real estate agency at first. She became a small time vendor after that, selling ins and outs in metro and at a marketplace. Life in Moscow expanded Tamara's circle of acquaintances. Aware of her philological degree and university diploma, one of them asked her to write a small piece for a newspaper once. Tamara did. The piece was accepted. The newspaper asked for more. Tamara became a free-lancer for the newspaper a year later (she would have become a staff correspondent but for her foreign citizenship). In the long run, employers put the young woman's professionalism and willingness to work above the color of her passport. Tamara ended up as the head of a whole team working on a major new project for the newspaper. She applied for citizenship of the Russian Federation and hopes to meet the New Year as a Russian citizen. M. is 26. He is from Shugnan on the slopes of the Pamir, Tajikistan. M. entered the Khorog State University and stayed on after graduation. He has two brothers and three sisters, all of them his elders. "As the traditions go, it is I who is supposed to be taking care of the parents. It so happened, however, that one of my brothers remained in the kishlak with the parents," M. said. "That's how we do things. Young man or girl always enters an institute or university whenever possible. Parents always do whatever is in their power to see their child through the college." When M. decided to try his luck in Moscow, everyone was shocked and tried to discourage the young man. "Forget it," my uncle kept saying. "They'll never admit you. You'll end up somewhere at a construction site. Stay here," M. said. "And yet, I'm obstinate, you know. I set my mind on it." M. passed all exams. He is a third-year postgraduate student now. M. lives at his relatives' place and works hard to cover the cost of the tutelage. All things considered, the young man - gifted and hard-working as he is - will do fine. An Uzbek by origin, Bahtijar looks like a Tajik. Probably because he was born in the northern part of Tajikistan and carries a Tajik passport. "There are no jobs at all to be had at home," he said. "All my friends and relatives - even my mother - are here. I've been in Moscow for 3.5 years." Bahtijar is a cabman. Bahtijar went to a Russian school in Tajikistan. His Russian is nearly accent-free. "Russians from Asia and Muscovites are different," he said. 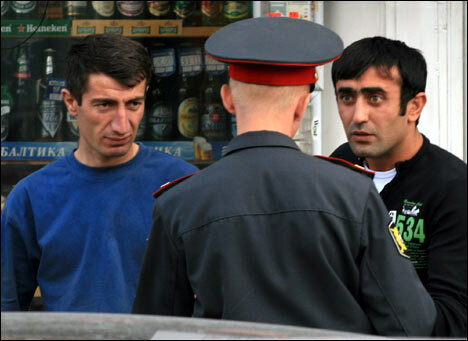 "You can easily tell whoever was born in Uzbekistan or Tajikistan from the locals. The locals never offer their seats to elders in a crowded metro train, for example..."
Bahtijar does not feel any antipathy towards the locals. He says he is comfortable with all. "Every nation needs respect, you know." Neither does he experience too many problems with the police. "No, no particular troubles with the traffic police or the policeman on the beat," he said. Local friends helped Bahtijar buy a cell phone. They will probably help him with purchase money for a new auto. "I want a foreign auto, not even exactly a brand-new," Bahtijar said. He does not plan too far ahead for the time being. Settling in Moscow and renting an apartment for the mother and himself will do just fine. Bahtijar is confident that he will accomplish it, sooner or later. Jamshid appraises his own attitude towards computers as "love from first sight" - ever since when he was ten and his father bought him his first computer. The kid immediately became enamored with it. He studied at computer-user courses and eventually rose to the level of more advanced studies. Computer college finished, Jamshid found a job with a publishing house. He also worked at an editorial office and photo studio afterwards. According to Jamshid, his pay there "was just enough for beer, potato chips, and some clothes." When, however, he met a girl he decided he had to marry, it occurred to the young man that he needed a better income to afford a decent wedding and a family in the first place. He decided to go to Moscow where his friends had already settled. Besides, he had an aunt in Moscow, a street-cleaner who agreed to put him up for the time being. Jamshid's friends helped him with a job at the same computer-repair company. They themselves had impressed employers with their skills, and their recommendation ("he is like us, from Uzbekistan") proved sufficient. Jamshid did not let them down. When he returned to Tashkent a year later to marry, his employer phoned Jamshid and asked him to come back barely a week after the wedding. Jamshid did go back three months later - with his wife. She is a cleaning woman nowadays, and Jamshid is still travelling the width and breadth of Moscow repairing his beloved computers. Saida is 50 but looks a decade younger. She came to Moscow from Uzbekistan on an invitation from friends of old. During WWII, Muscovites were evacuated to Central Asia and some families ended up in Samarkand. Saida's father was fighting on the front, her mother remained at home with three children. A family from Moscow stayed at their place several years before going back. The two families remained in touch, regularly visiting each other. Saida was born after the war, but she knew the Moscow family from the frequent visits and was friends with Yekaterina, the Muscovites' youngest. Saida's husband died of a heart attack two years ago. Raising two children on a teacher's pay was not easy. When Yekaterina discovered what had befallen her friend in Samarkand, she told her husband in no uncertain terms that "It's our turn to help them out now" and invited Saida to come to Moscow to take some time off and, with luck, earn some money. That was how Saida found herself in Moscow. She became a shop floor operator. The work is anything but easy - deal with customers and keep an eye on the rest of the premises as well. Fortunately, Saida has a work permit. 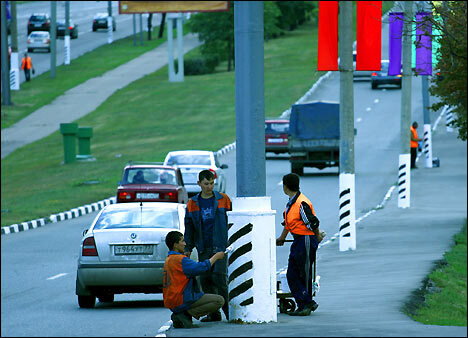 Non-citizens of Russia are paid smaller salaries than Russians. They are not entitled to bonuses at all. When, however, something is wrong, non-citizens and citizens alike are charged. Saida works every day and takes a day-off only when she feels she is utterly exhausted. She averages 10-12,000 rubles per month. Saida speaks Russian without an accent and therefore has no problems with customers. Not all of the latter, however, are amiable. Some are actually rude, but Saida tells them off - politely but firmly. Customers appreciate Saida's courtesy and candor. When she took several days off once and returned to work afterwards, the customers who had been missing her asked Saida not to leave again. 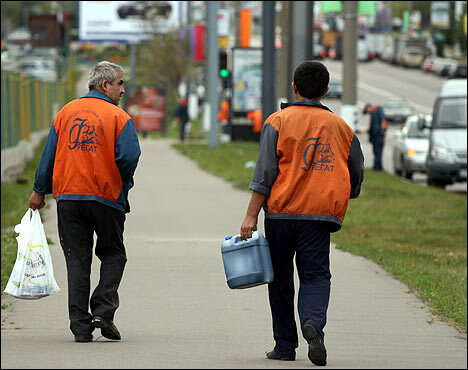 This Uzbek from the Kulyab region of Tajikistan has been living and working in Russia for eight years. He introduces himself as Yuri because "his name is difficult to pronounce in Russian." Yuri has parents, sisters, brothers, and the wife with a son in Tajikistan. Many other relatives (brothers and cousins, uncle, nephew) are in Moscow and the Moscow region. The first to come to Russia, Yuri brought them all one after another. Back in Tajikistan Yuri was an agriculturist (he had majored as one once) and then a kneader. His parents objected to his leaving for Russia but he managed to persuade them. In Russia, he worked at an auto maintenance center near Sheremetievo airport before becoming full-time confectioner in Dolgoprudny near Moscow. Yuri is a born confectioner. "I'm doing all right," he smiled. "But then, I've been working for six years now." A new restaurant in the satellite town of Khimki employs Yuri nowadays. Yuri has about 30 relatives and friends in Moscow and Moscow region. They meet regularly and always celebrate whatever deserves a celebration together. "It was I who recommended all my relatives to employers," Yuri said. "That makes me kind of foreman because I was the first to come over here. Whenever there is something to discuss, our superiors come to me." Yuri makes enough to be able to help his family at home. He hopes to obtain Russian citizenship and establish his own business. "I couldn't go back anymore," he said. "I've seen already what life may be like." His parents do not object anymore.